I happened across this wine in Manila, at the duty free shop. I have tried various Trivento wines before and have enjoyed them all so I felt confident that my $15 would not go to waste. I was correct. Albeit not as complex as the Golden Reserve line, the Tribu was well endowed with currants and tea leaf on the nose. The palate was very fruity with red berries and a vegetal note that I enjoyed. Fine grained tannins were very well balanced and the whole package was smooth. We drank this one before dinner and I reckon it would pair well with some sirloins and gratin potatoes. Charcuterie would be an excellent choice for an early evening sundowner as well. 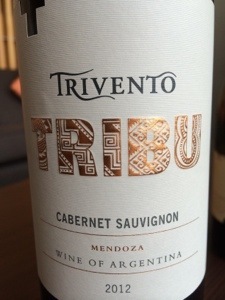 I am going with 88 points and 3 stars for this Argentinian wine. Salut….